About 3 weeks ago, my Mom got crazy and started chasing my sister and me in the kitchen. No, she didn’t go bonkers because we didn’t fix our bed nor because we never helped her in the household chores (though that’s another story). She was running after us because she wants a KISS. Imagine my and my sister’s horror of horrors when suddenly after she came out of the bathroom, she zeroed in on my sister asking if she can kiss her. “BUNSOY PAKISS”, she said. Somebody has gone INSANE! My sister and I looked at each other and readily stood up to protect our cheeks! My sister protected herself from my Mom’s affectionate gesture by grabbing a plate and a glass holder to cover her face as she runs round and round the kitchen table avoiding Mom’s lips. Then she told my Mom to get her dose of kiss from me which I adamantly refused by lifting a dining chair and using it to shield my face as I also run away from her. It was hilarious seeing 3 adults going round and round the kitchen table with the plate and dining chair in tow. 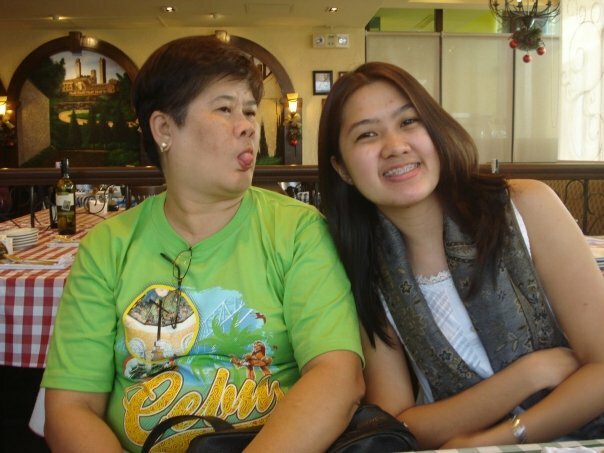 To the person where we got our crazy genes, HAPPY MOTHER’S DAY! Grow young Mmy. We want a cool mother forever.